If you move your finger on the world map from big India down south you will find a small piece of land only a few kilometers off the coast. The unique island has many names: ‘Teardrop of India’, ‘The Pearl of the Indian Ocean’, or formerly ‘Ceylon’. But you probably know it by the name Sri Lanka. Fascinating, lovely, rich in variety and short distances are terms people use when they talk about the green gem in the blue Ocean. Sri Lanka’s natural beauty comes from its amazing tropical rainforests, dreamy landscapes, sandy beaches, rich cultural heritage and the world-class waves which make Sri Lanka a perfect touristic place for surfing and holidays. The island is home to the most biodiverse fauna and flora in Asia and has been hugely successful in keeping their energy “clean”. But enough of the superficial information. Let’s get into it! Surfing in Sri Lanka – The Different Regions and Surf SpotsTravelling to and around Sri LankaThe History of Surfing in Sri LankaSurf Events in Sri LankaCulture in Sri LankaWeather, Climate and Water TemperatureFood in Sri LankaTop 10 Highlights inWhy Sri Lanka with Planet Surfcamps? Sri Lanka’s surf regions can be divided in West and East. The East Coast works very well between May and October. The surf season in the West starts in January and ends in April. Also November and December offer quality conditions. This is the most famous wave you’ll hear about if you ever find yourself searching for a surf spot in Sri Lanka. Its popularity is mostly due to the fact that it has something to offer for every kind of surfer, advanced or beginner. Not to mention the amazing sandy beaches and the chilled local vibe. 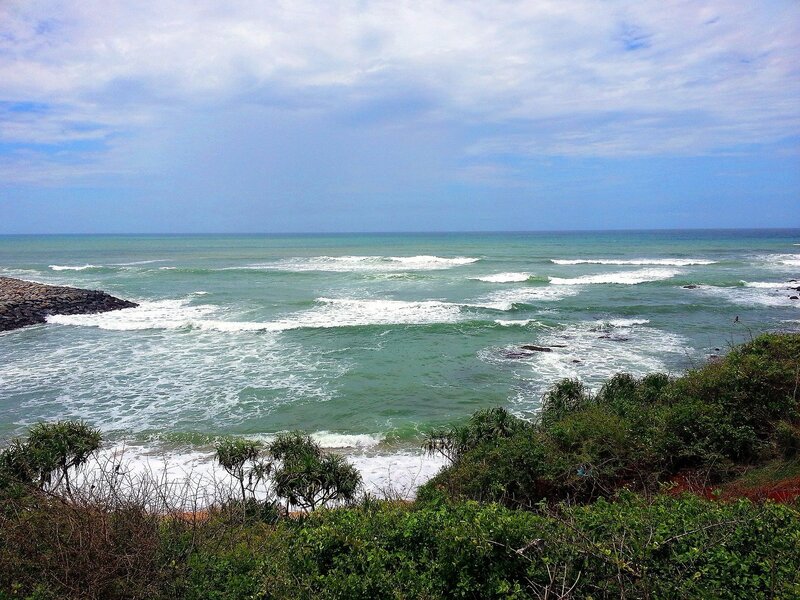 Arugam Bay is the most well known swell on the East Coast, so it can attract a big crowd. A useful tip to handle the masses would be to paddle further out and patiently wait for the wider waves out back. The diversity of people won’t let anyone feel out of place, but if this bunch ever gets too much to deal with, there are many other spots close by accessible via the local tuk tuk rides. The surf spots are pretty easily accessible from the airport via train of tuk-tuk ride. Trains run a few times a day and are actually surprisingly punctual. Even though Sri Lankan people are famous for their hospitality, there are some rules you should take notice of when booking your trip. 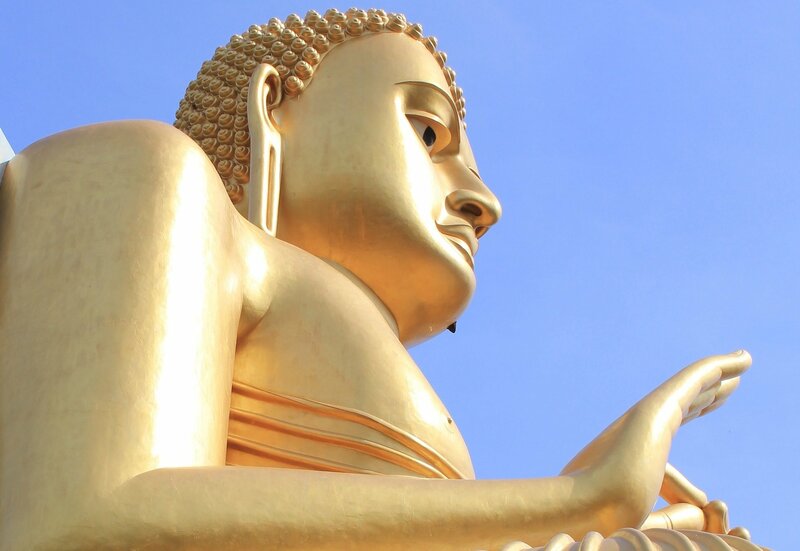 For instance, religious tattoos are considered offensive and visitors with Buddha tattoos or other religious tattoos may well be arrested or deported. If you wish to come despite the warnings, best cover the tattoo at all times when outside the ocean. Also, keep in mind that Sri Lanka values its clean air and smoking is forbidden in most places. Surf tourism has been a substantial source of income in Sri Lanka for a long time now due to the tropical weather, warm water, beautiful sandy beaches and of course, the amazing surf, however the surfing tradition was disrupted during the Civil War in Sri Lanka (1983-2009). At this time the island was struggling not only with the war, but also the consequences of the disastrous tsunami that hit Sri Lanka in 2004. These events made it difficult for locals to safely access beaches and tourists were hesitant about visiting the surf spots. In the last decade though, surfing has expanded both as a trend and a business and more people than ever are interested in what the island has to offer. The demand for surf schools and surf camps is higher than ever and is only likely to increase in the future, as Sri Lanka becomes a more popular surf spot. People from all over the world come to surf Sri Lanka’s waves, go on adventures around the jungle or exploring the giant Buddha statues. Nowadays, surfing is an important part of the islanders’ lives and Sri Lanka even hosts some surfing events and competitions. Arugam Bay which is ranked among the top surf points in the world will host the international surfing competition this year. 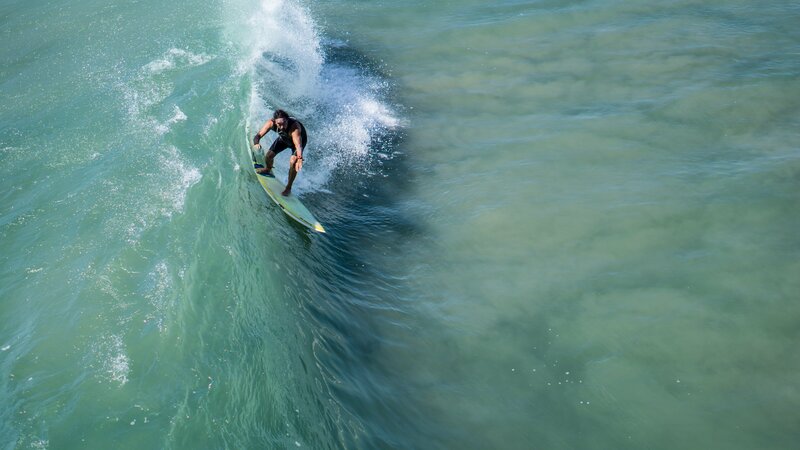 Surfers taking part in the competition are guaranteed to find the ideal waves for surfing at the bay. If you are visiting Sri Lanka during the months of June and July don’t miss this exciting event. 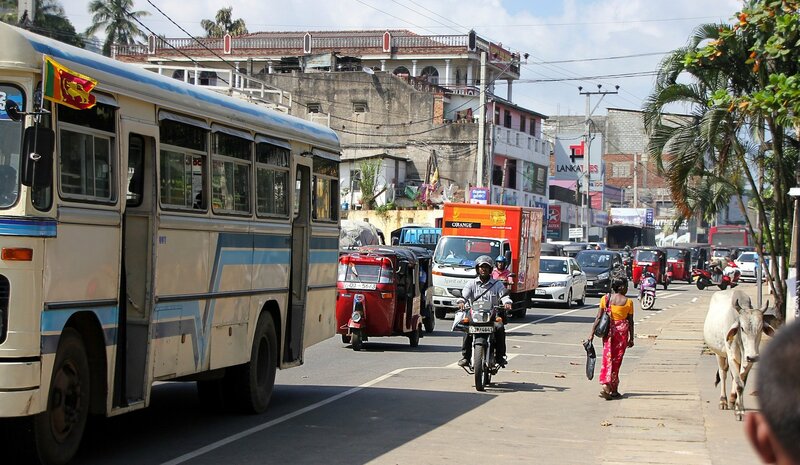 Sri Lanka is home to around 21 million people speaking mostly Sinhala and Tamil languages, out of which both are national languages, but Sinhala is the only official one. The country is divided into 8 provinces: Central, North Central, North Eastern, North Western, Sabaragamuwa, Southern, Uva and Western. 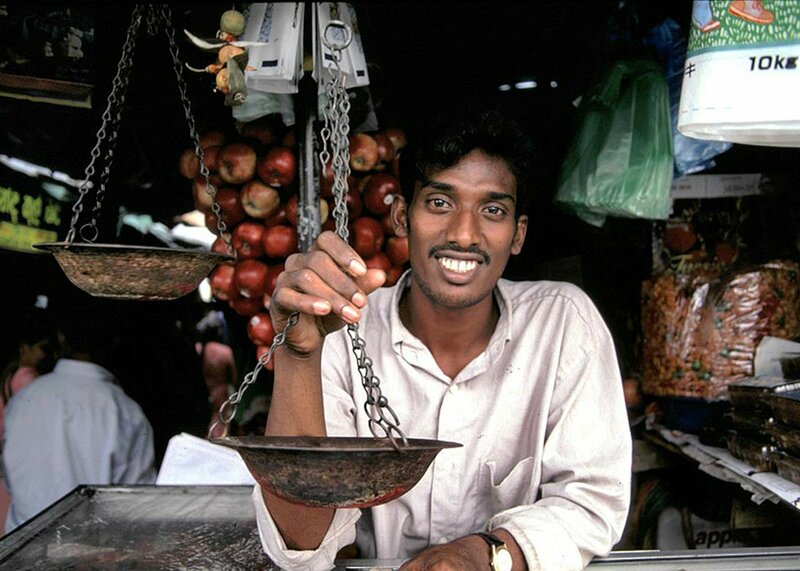 Sri Lankan people are often well educated (highest literacy rate in South Asia with 92%) and are quick to adapt western behaviours, inspired by incoming tourists. 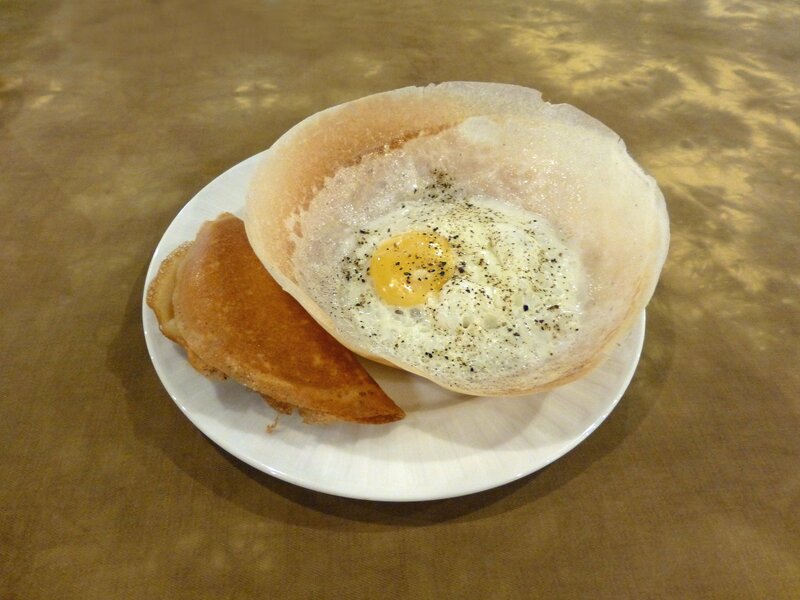 Despite this, Sri Lankan people have very strong traditions. Ancient festivals and rituals are still performed (sometimes especially for tourists, but mostly by the more conservative Sinhala and Tamil. 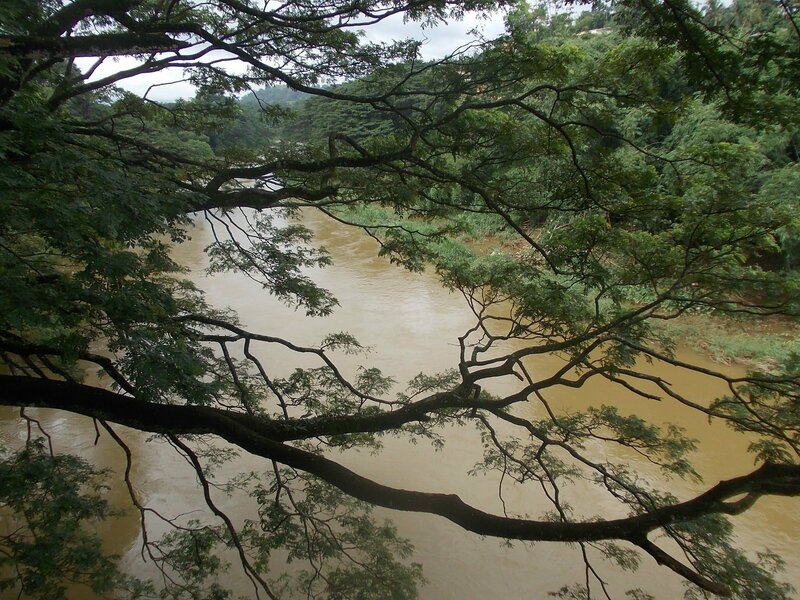 According to ethnicity the island could be divided into the Sinhalese North and Tamil South. A pretty cool thing is the Sri Lankan view on gender equality. The country has been known to favour equality for thousands of years, as both men and women have ruled the land and ancient drawings portray men and women with the same status and wearing the same clothes. Actually, the first female prime minister ever was Sri Lankan. What an example! Sri Lankan people are very much into cricket, but volleyball is their actual national sport, so if you get informed on that, you’ll definitely score some points with the locals. Locals had been surfing their beaches since way before the island became a popular place to visit, but the sport was disrupted during the civil war and later as a consequence of the 2004 tsunami. However, in the last couple of years surfing has been revived and more local people than ever are surfing, probably encouraged by the visiting surfers. Locals have been described as hospitable and generous. They most often enjoy the influx of tourists as they associate them with business. Many people rent out surf boards from their homes, many artists and craftsmen sell their products on beaches and streets and even the traditional stilt fishermen seem to like being watched and photographed. 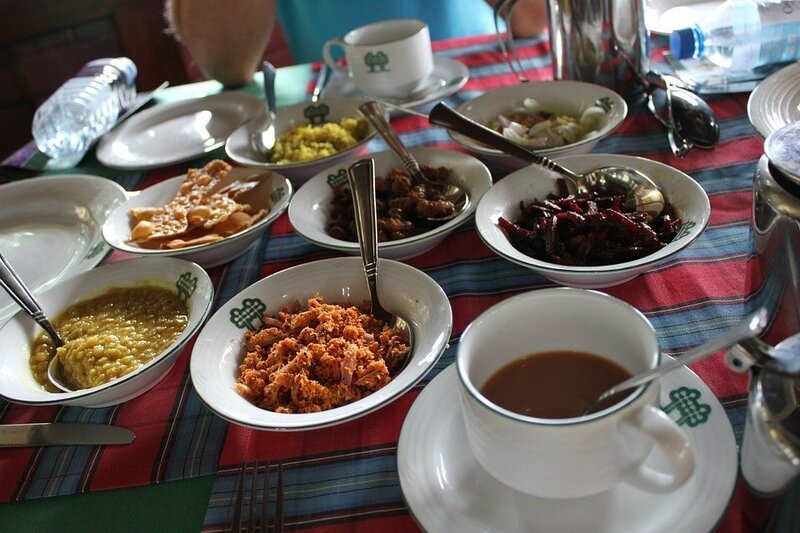 Find more about Sri Lanka’s culture here. In Sri Lanka you can find really fun waves featuring offshore wind, which is super consistent during monsoon season (wind and precipitation). Also, you can find good surf almost the whole year: at the southwest coast, the best season is from November to March and it the east coast from May to September; so if you want to surf and enjoy, then you should pick those dates for your trip. 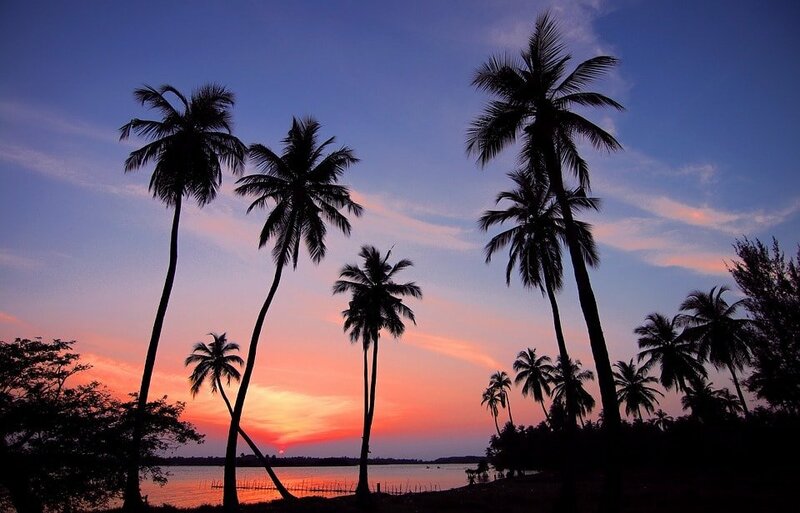 About the weather itself, it’s a tropical climate with distinct dry season (from May to October) and wet season (from November to April) at the West Coast’s spots, like Arugam Bay; all of it slashed by the monsoon. Generally, the best time to travel to Sri Lanka could be between November and March for the West coast and between April and September for the East coast; so you are nice and dry out of the monsoons and you can also coincide with the surf seasons, with a 27ºC average temperature the whole year. Wannasurf gives you more insights about the weather conditions. Check it out! 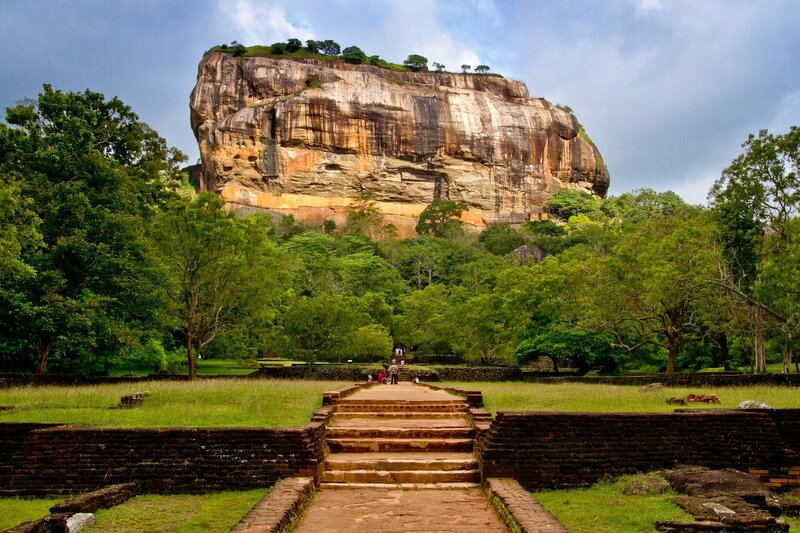 It’s a must-see kind of place if you’re ever in Sri Lanka. 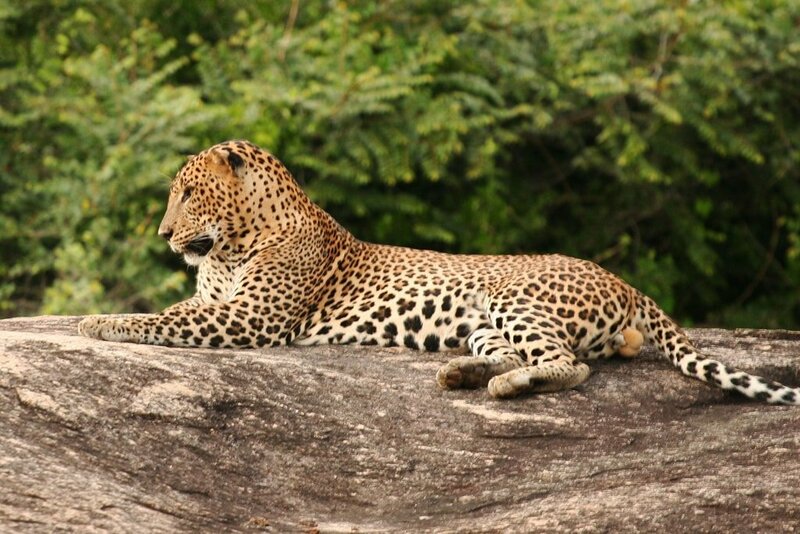 The Yala National Park has amazing wildlife featuring leopards and elephants. Rent a tour with a local Jeep safari. The experienced guides will show you the best spots to see the wild animals. The Indian Ocean is full of colorful life. 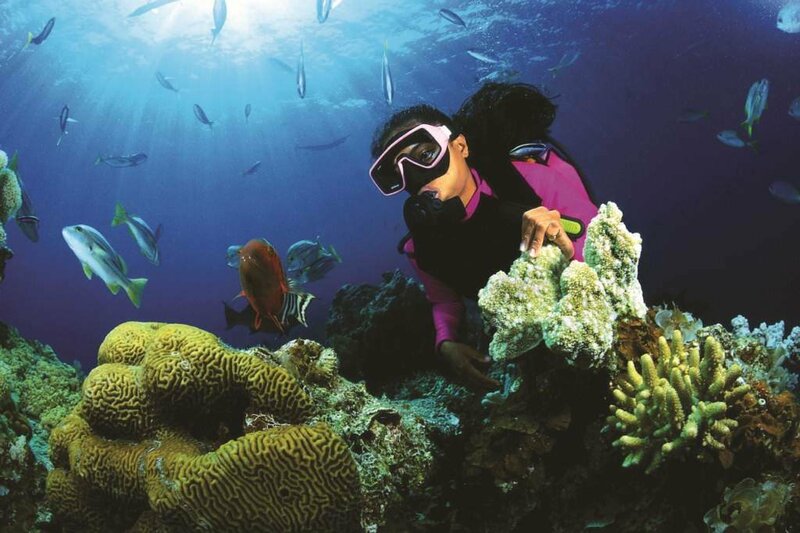 You can book your diving tour with Sri Lanka Diving Tours in Trincomalee or Baticaloa. They will provide you with gear and knowledge and bring you to the nicest spots of course. The stilt fishers symbolize the country like nothing else. That’s why you will find them on every second postcard. 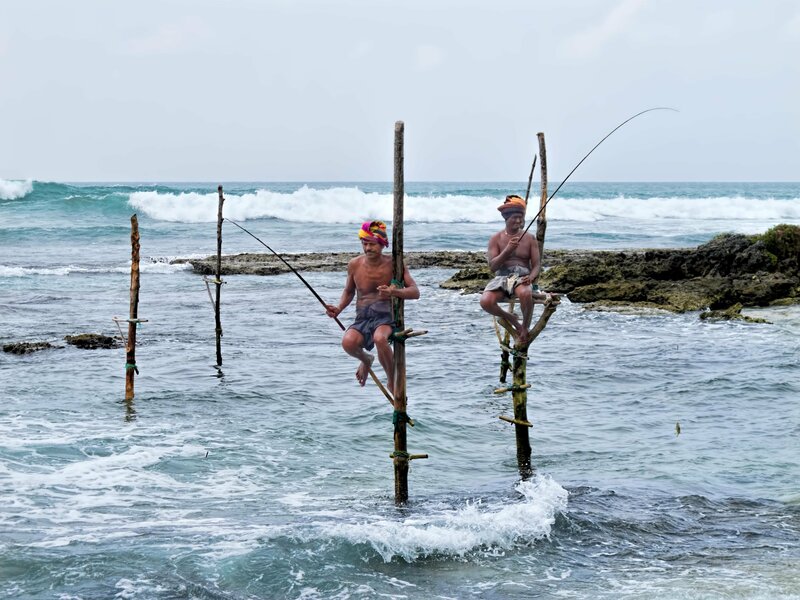 Fishers use the traditional stilt technique all around Sri Lanka, almost always in the Weligama area. But be careful: If you try to take a photo some of them will come out of the water to claim money for the picture. 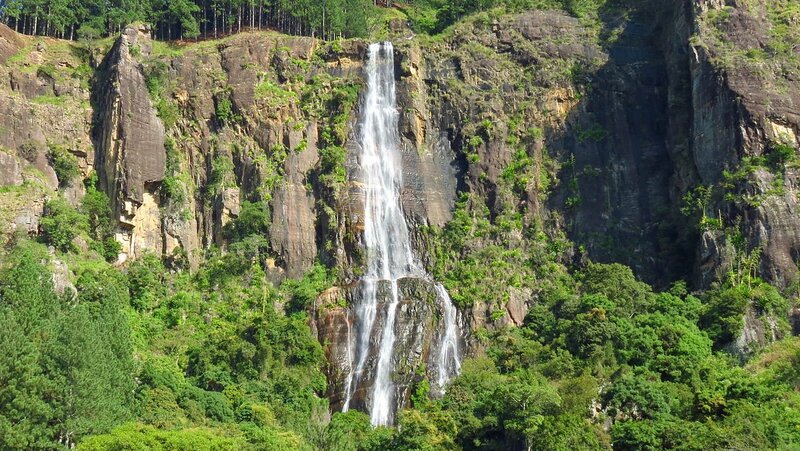 There are plenty of waterfalls in Sri Lanka but the highest and for sure the most iconic waterfall is the Bambarakanda. 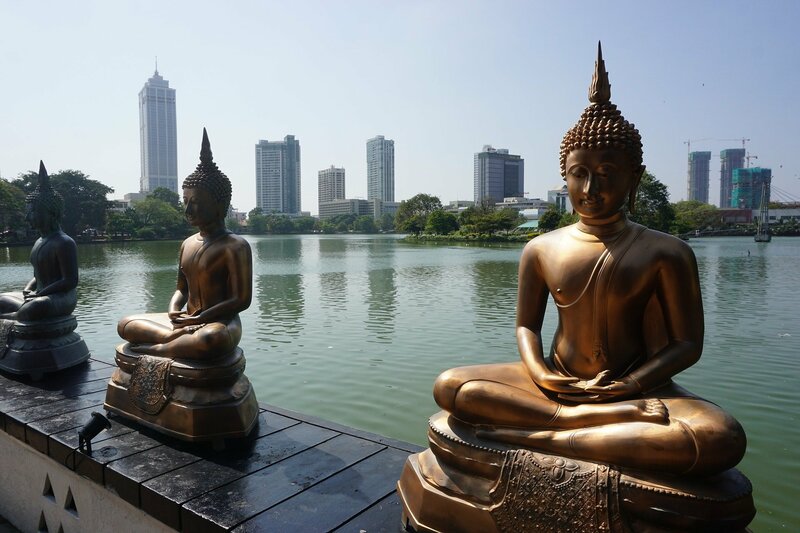 It’s not too far away from the capital Colombo. So you can visit the waterfall right before or after your trip through the beautiful country. 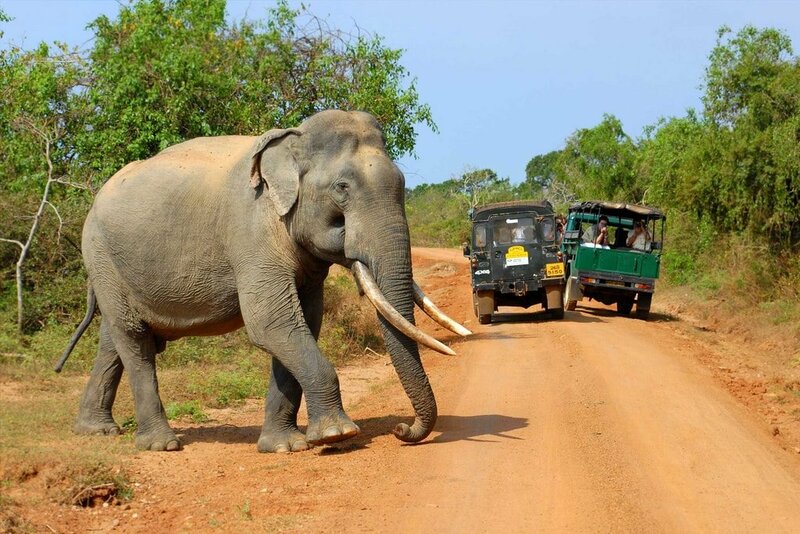 If you weren’t lucky and couldn’t get a glimpse of an elephant in the Yala National Park, here’s your second chance. The Pinnawala Elephant Orphanage in the same-named village is a nice place for sick and orphaned elephants. You can support the organization by visiting the peaceful animals. Apparently one of the unofficial 8th wonder of the ancient world, reported by many travellers as worthy of visiting. King Kassapa I. built a fortress on the 200 meter high monolith 500 A.D. You can still admire the old remnants. There aren’t only beaches, old fortresses and wild animals to see. 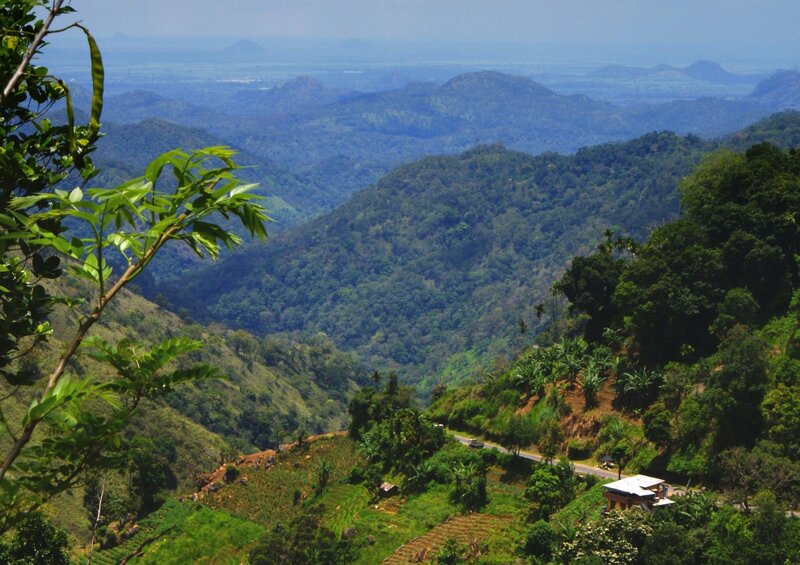 In the center of Sri Lanka is Ella, a nice little village surrounded by tea plantations and forests. 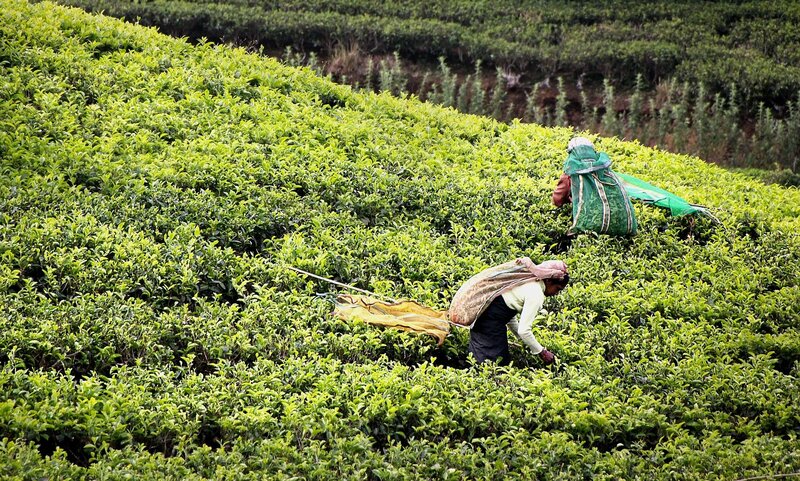 You should absolutely go for a hike in the beautiful nature and visit one of the tea factories. At clear sight you can see the west, east and south coast at the same time. Suddenly everything seems to be very small. 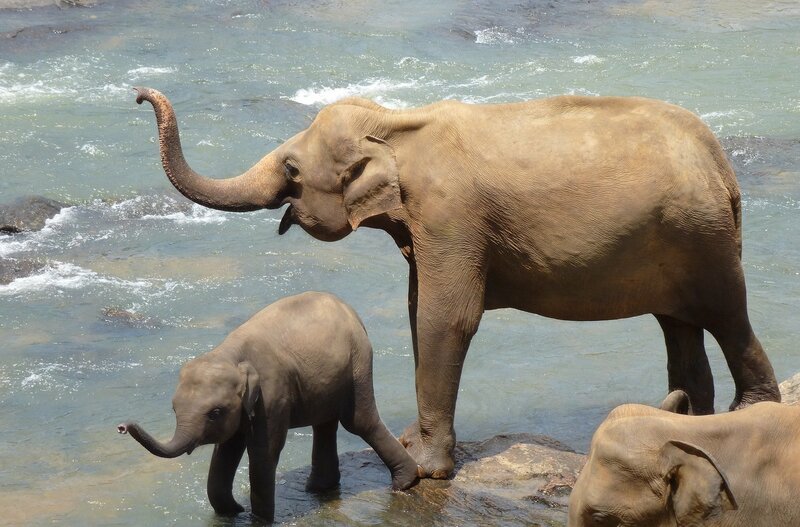 Mirissa is the place to be when it comes to watching the big noble animals. 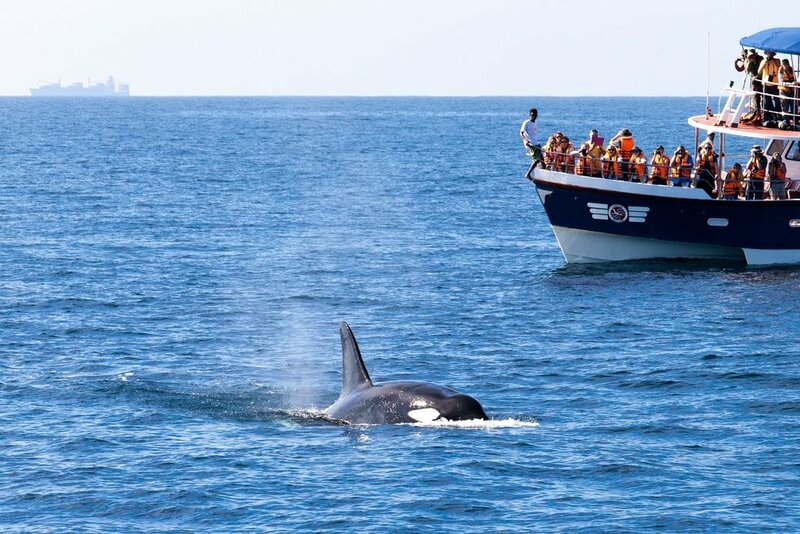 The guides know exactly where the whales appear and it’s almost guaranteed to see one of the giant sea dwellers. Everything is more spectacular from above. Try it and you’ll get a unique feeling for the island’s small size. You’re gonna be able to look from coast to coast. The island is full of more or less well known spots that are ready to be explored. So just put your shoes on and start walking! Why Sri Lanka with Planet Surfcamps? Sri Lanka offers the dream surfing conditions throughout most of the year and produces waves to satisfy the needs of every surfer, no matter their surfing levels. It’s becoming increasingly popular with tourists and surfers from all around the world making it the perfect place to set up a surf camp. Sri Lanka is an amazing place to meet new people with its diverse international tourism and plenty of unexploited spots that attract those seeking to escape from the masses and surf a destination only known to a special few. While in Sri Lanka there is so much more that you can do after a long day in the ocean. 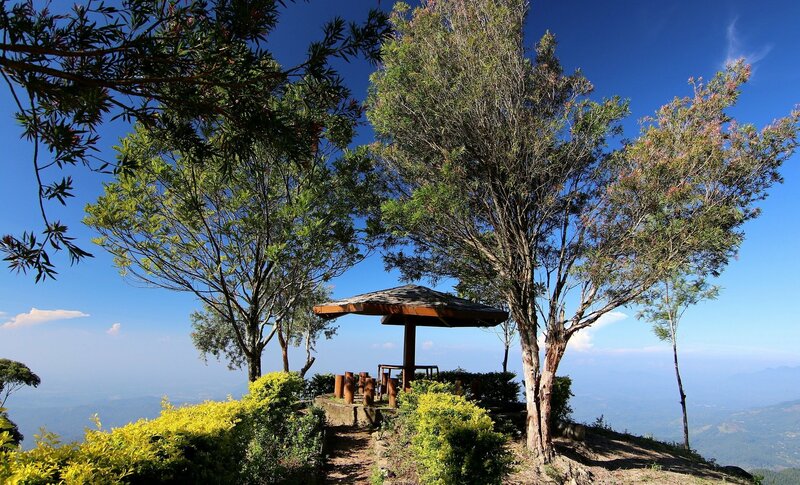 If you feel like doing exercise, the amazing landscapes will provide you with sights that you will never forget. It’s also fascinating to just walk around and get to know the local customs and traditions, you’ll find that they’re so much different that anything else you’ve ever seen. If you’re more into the party scene than the exploring scene, don’t fret, Sri Lanka is prepared for that as well. More and more local bars and clubs are opening up in the bigger towns as the residents’ response to the growing tourism in the area. You’ll find cool spots all around to unwind with some good music after your surf course. Not many things are certain in this world, but this we know for sure: a surf holiday with Planet Surf in Sri Lanka will be an experience you’ll never forget.